Moderate - Some days will include walking up to 5-6 miles on cobblestone and climbing up and down stairs. Ancient & Medieval cities are best explored on foot and in the case of Venice can only be explored on foot. Arrive at Rome airport (FCO). Transfer to hotel and remainder of day at Leisure. This evening there will be a meet and greet. Followed by a welcome dinner. Rome, The eternal city - a city steeped in history, vibrantly alive and exciting and absolutely unique! Today we will visit St. Peter's Square, see the Vatican Museum, the Sistine Chapel, and St. Peter's Basilica. 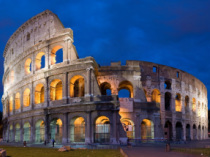 This morning enjoy a visit to the mighty Colosseum and the Roman Forumn. After lunch our walking tour continues on to the Pantheon, the Trevi fountain and the piazza de Spagna. This morning, we will do a session a the Rome temple and spend time exploring the visitor center. After we finish, we will make a stop at the hilltop town of Orvieto on are way to Florence. This Renaissance gem and city of the Medicis will keep you enthralled for a whole day. We will enjoy an Italian cooking class for lunch. After lunch, enjoy a walking tour with a local guide, which includes many of the major plaza's and the Doumo. Top off the day with a tour of the Uffizi Gallery and the Accademia (the home of Michelangelo's David). 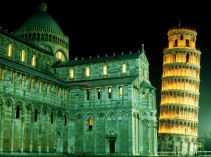 This Morning, we will drive to Pisa for a visit to its Square of Miracles and the amazing Leaning Tower. 180 feet high and no less than 16 feet out of the perpendicular. This is a site that you will talk about with friends for years to come. Later, we will drive to Lucca, where you will enjoy time to explore this beautiful city on your own. Return to Florence. Today enjoy a day of leisure to explore Florence on your own. We will start the day off with a guided tour of Sienna. Then you will have free time to explore on your own. After lunch journey to San Gimignano, one of Tuscany's greatest attracations. Its medieval squares, town walls, streets, alleyways and 14 towers. Return to Florence. This morning we will drive to the amazing city of Venice. Venice is more like a marvelous film set than a real live city, with its criss-crossing canals, gondolas, bridges, palaces, and little quite piazzas. There will be an orientation tour and a once in a lifetime opportunity to ride in a gondola through the grand canal. This morning we will travel by water taxi to the island of Murano. Murano is famous for blown glass. Enjoy the afternoon to explore Venice on your own. This evening we will have a group farewell dinner. * This amount includes all the tems shown in the itinerary and a travel insurance policy. The travel insurance policy covers the cost of the tour and your international airfare for those up to age 69. Travelers older than 69, will need to be approved to travel and will be subject to an additional insurance premium.